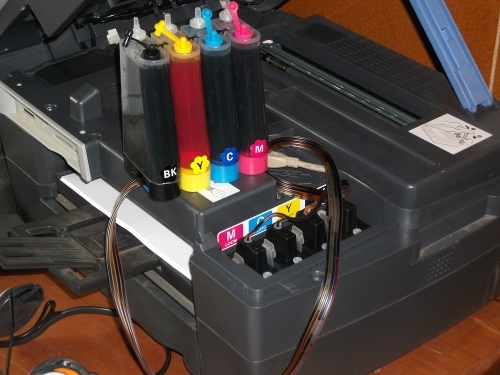 It’s called a CISS…Continuous Ink Supply System…to replace the piddling little cartridges that go in the printer…great for when you are doing that big print job and don’t want it interrupted by ‘Ink cartridge(s) empty’…it cost us NZ$55 for a set of standard cartridges that are considerably smaller than the CISS tanks; the CISS was NZ$75 delivered and is refillable which is both greener and practical. I keep the tanks behind the printer, out of the way of small hands and paws, and the feeder tubes from the tanks to the dummy cartridges run through the channel used for the USB cable. I only installed it last night and printed out a couple of pages – to my aging eyes, the print and colour quality is as good as it was before so I’m happy – I’m less happy about the fact that this printer persists in printing greys as greens. How do you build a credible and effective government and security forces in 18 months? This entry was posted in Playing with Toys, The Thursday/Friday War and tagged CISS, Paper Models by SJPONeill. Bookmark the permalink.